Having recently had Harpoon’s Leviathan Baltic Porter, I went in search of another Harpoon as I filled a mixed six of stout and winter warmers over at Roger Wilco’s Voorhees location. I found a bottle of their Chocolate Stout that sounded like it would be right in my wheelhouse. For those who don’t know Harpoon, they are one of the first craft brewers in New England and date all the back to 1986. That’s over 25 years of production which to craft brewing is like the Stone Age. They have plants in Boston and Windsor, VT and staying true to their craft beer roots are still operated under the watchful eye of founders Rich Doyle and Dan Kenary. Harpoon has six year-round beers (the Harpoon IPA is their best seller), four seasonals, the 100 Barrel Series, the Leviathan Series and some limited releases (like the Chocolate Stout). As of April 2012, Harpoon was the 8th largest craft brewer in the US and the 3rd biggest on the East Coast behind the Boston Beer Co. (Sam Adams) at No. 1 and the Matt Brewing Company (Saranac) at No. 6. A chocolate stout is a beer with a noticeable dark chocolate flavor. This flavor is created from the use of darker, more aromatic malt that has been roasted or kilned until it acquires a chocolate color. 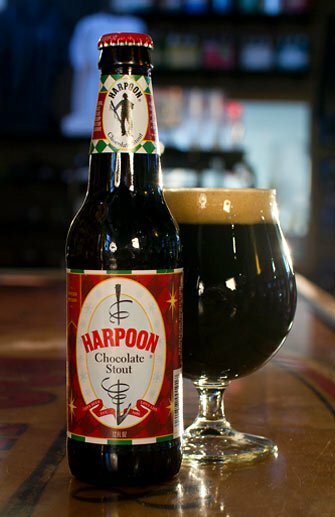 Harpoon Chocolate Stout is brewed with an abundance of chocolate malt and a touch of chocolate. Appearance: Black with a lot of tan foam. Aroma: Heavily roasted malt, dark chocolate and coffee. Taste: Sweet with a big hit of Baker’s chocolate and a mild coffee flavor and a slightly bitter finish. I found that this was very chocolaty while colder and that the coffee flavors intensified as the beer warmed. This was a very creamy and well balanced beer. Not too coffee and not too sweet just smooth and easy drinking. Being a native Bostonian, Harpoon can pretty much do no wrong. I haven’t had this specific beer but it sounds good. Next time I’m back East I’ll have to pick one up…if it isn’t summertime yet. That said, perhaps their chocolate stout would rest atop one of the wave curves. I’ll pick one up and pack a burlap buttocks carpet for the ride down the ratings slide just in case. I mean, who wouldn’t!